Message #1 Posted by Diego Diaz on 30 July 2010, 6:44 p.m. The poor little thing arrived in a very bad state. Seems that someone has attempted sort of repair with little success. Ok, the silicon glue has been removed, the connector solders have been reworked and the RAM chip replaced (the original one had one broken pin, thus the tiny wire in the second PIC). 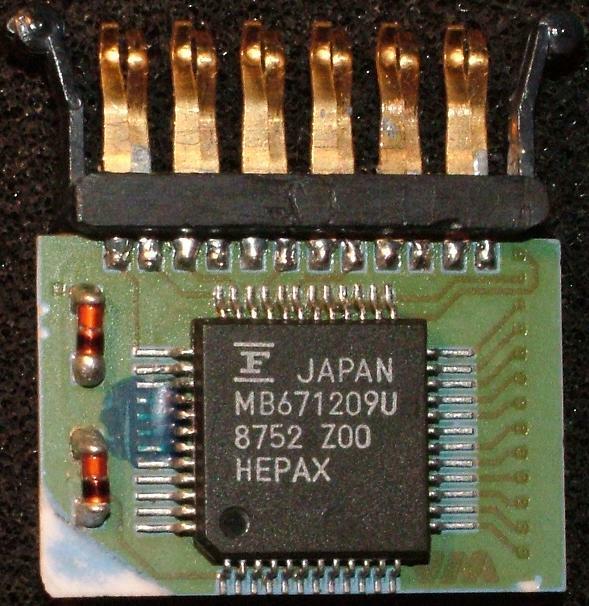 I need some help from those which may have pictures (or may take them) form HEPAX chip (MB671209U) both from STD and ADV HEPAX. The question comes from the fact that the rebuilt HEPAX above arrived into an "ADV HEPAX" labelled shell, however, once rebuilt it shows only two pages of HEPAX RAM. 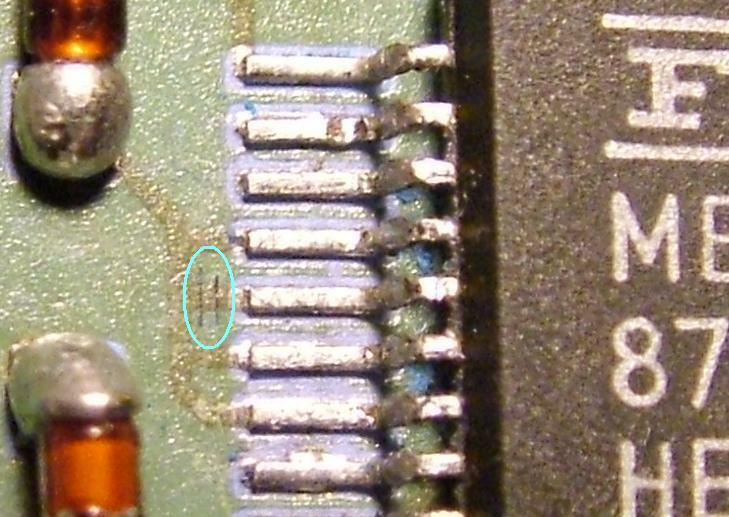 Also both port-detecting lines (B3 & B4) are connected to the HEPAX chip. Advanced HEPAX only needs B4. But, to make things a little bit more confuse, the module shows up in CAT 2 as "HEPAX 1D". - Module is a late (ver 1D) STD HEPAX, and it was placed into the wrong shell. - Module is an ADV HEPAX with a faulty address line, thus the lack of two RAM pages. Are there different chips for STD and ADV HEPAX? Does someone have pictures to clarify this doubt? With ADV HEPAX inserted into port 2, [<-] [ON] (perform memory lost)*, then execute "HEPAX 002" and check which page is HEPAX 1D using. Try with ports 4, 3 and 1. *NOTE: [ENTER] [ON] [ON], may also work without losing main memory contents. "clonix41(at)gmail(dot)com" in case you can't place pictures in the forum. Re: ADV or STD HEPAX? I thought the difference between STD and ADV HEPAX was that the latter has RAM pages at all.. According to HEPAX manual Standard HEPAX comes with 8K (two pages of RAM) which are allocated to the port addresses where the HEPAX is plugged in... (that's exactly the way the module I've rebuilt is behaving) and Advanced HEPAX comes with 16K RAM (4 pages), and uses both ports addresses (1 & 2, if you plug it into port 1 *or* 2) or (3 & 4 if you plug it into port 3 *or* 4). - On one hand, the Address line A14, required to address two more pages, is properly connected to the RAM chip. Thus pointint to an ADV HEPAX. - On the other hand, the lines B3 and B4, required to sense the port in which the module is plugged in, are both connected. Pointing to a STD HEPAX, since ADV. HEPAX only needs B4. Either case I'm very happy to have bring back to life a very badly damaged HEPAX module. What a superb restoration Diego! There's no telling that the before and after pics come from the same unit, fantastic job. I can confirm (as though it were required, which it isn't) that the Advanced Hepax has 4 pages of memory as you indicate - so perhaps there's something elso wrong with that unit. I always suspected that the STD and ADV HEPAX varieties were only a marketing plan. 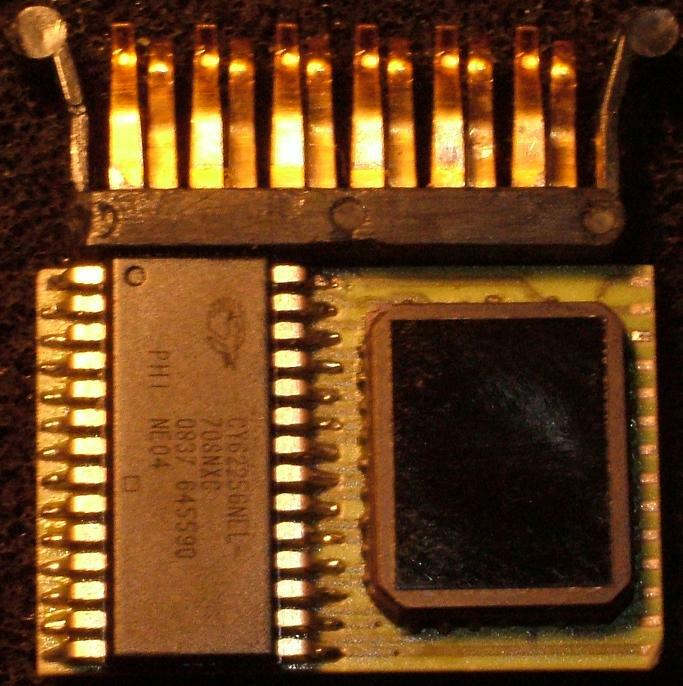 The RAM chip is 32Kbytes in both cases, providing 16kwords. At the time (and still now), there was 8kbytes and 32kbytes chips but no 16kbytes chip. The ROM version is independant of the STD or ADV variations. If I was the HEPAX designer, I would have differentiate the 2 variations at PCB level, maybe using a pin of the ASIC. Thanks for your kind words �ngel. 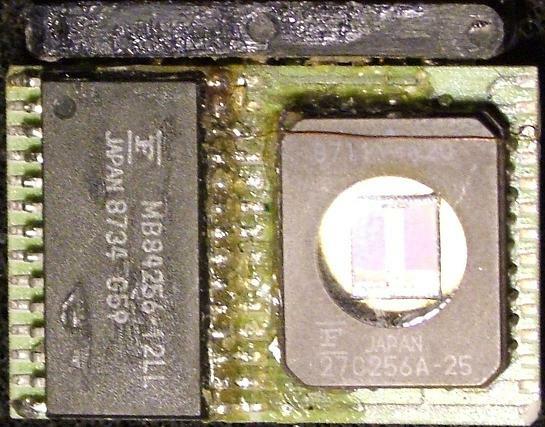 A nice part of the good final appearance is thanks to the ceramic PCB which allows a high level of abuse. Paraphrasing Sting: "There's a little 'blue' spot in the 'board' today..."
One of the things that called my attention was this "blue spot" you can see in the pictures covering a few pins of the HEPAX IC. Circled in blue the (astoundingly narrow) cuts, probably made by a diamond saw, since very few materials can cut ceramic with this precision. The four pins are too conspicuous to be a sort of PCB strapping cofiguration as J-F, has pointed out. As a collateral effect I've ended up with a full detailed schematic of the HEPAX module. Will place it at TOS as soon as I move it from paper to file. Perhaps now we know why they were so keen on using silicon glue! I wonder sometimes: where are all those people who created these masterpieces? How come they don't peep into this (or other forums)? I'd give an arm and half leg to have the documented source code for the HEPAX, or the CCD for that matter (BTW, I suspect *someone* must have them... I wish he'd share it with the community but no such luck). Never mind, just rumbling about it I guess. Edited: 31 July 2010, 7:57 a.m. The pins in the strap are numbers 40, 41, 42 & 43 (top to bottom). In fact #43 is internally connected to Vcc so it doesn't matter. Thanks a lot for your comments and support, and enjoy your 41's! Cheers from the Canary Islands. Edited: 31 July 2010, 11:28 a.m.